Known as a silent killer, electric shock drowning (ESD) takes the lives of several people annually, and still many of us are unfamiliar with this condition. ESD happens when a swimmer is exposed to electric shock while in the water. While both boaters and swimmers often take every precaution necessary to ensure water safety, ESD still happens. Electric currents sometimes escape from docks, lights, or low-level AC boats into the water. ESD can cause death either through the shock from the electrical current itself or through the victim’s drowning. These accidents are usually caused by faulty electrical or wiring on docks or boats. ESD can happen in saltwater or freshwater and can occur in private or public marinas and boat docks. Unfortunately, even a small amount of electrical current that escapes due to faulty wiring can be fatal. The law requires that all electrical connections that are near water must have a working ground fault circuit interruption technology. Some places where electric currents can leak out into the water include pools lights; generators, pumps, motors, heaters, and boat lights; jacuzzis and swimming pools; marinas; water parks; fishing piers; boat docks; and water parks. Notably, there is no visual cue that would let someone know that the water has electrical currents running through it. It does not take much electrical current in the water to cause paralysis and drowning. Water can seem safe at first and then become electrified in a matter of seconds. If you or someone you care about experiences the above symptoms while swimming, it is vital to get out of the water right away. According to the Electrical Safety Foundation International, if you witness an electric shock drowning happening you must turn the power off; throw a life ring out; dial 911; and do not enter the water as you may be harmed, as well. Determining liability can be difficult in ESD drownings because in the majority of these cases the autopsy report does not show signs of electrical injuries. In other words, unless there is an eye witness at the time of the incident who experienced and reported that the electric shock in the water caused the ESD, the accident will likely be labeled as a general drowning. If you have been harmed by an electrical water injury, or a loved one has been hurt or killed due to ESD, know that there is help available during this difficult time. 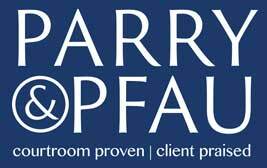 The experienced Nevada personal injury attorneys at Parry & Pfau have fought for the rights of the injured for several years, and are ready to fight for you. You or your loved ones may be entitled to monetary compensation to cover medical expenses, loss of income, and pain and suffering as a result of the accident. Click here today to schedule an initial case evaluation with one of our experienced attorneys. Newer PostDoes Immigration Status Affect Nevada Personal Injury Lawsuits? Older PostIs it Legal to Get Paid “Under the Table”?